When it comes to Vias, it’s known to us all that Vias can be divided into Through-hole Vias, Blind Vias and Buried Vias. They have different functions. With the development of the electronic products, Vias play a vital role in the interconnection between layers in a printed circuit board, The application of Via-in-Pad is widely in small-scale PCBs and BGA((ball grid arrays).As the necessary high-density BGA (Ball Grid Array) and SMD chip miniaturization, the use of Via-in-Pad technology has become increasingly significant. Due to these advantages, via pads are widely used in small PCBs, especially PCBs that require a limited BGA space and are focused on heat transfer and high speed design. 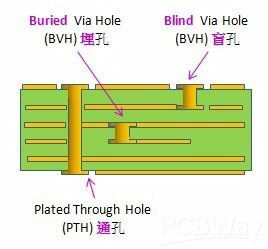 Although blind holes and buried holes help increase density and save space on the PCB, through-hole pads are still the best choice for thermal management and high-speed design elements. Taking into account costs, different projects can lead to different costs. Therefore, if your project involves vias and you cannot choose which type, please contact our engineers for the best solution. With the reliable Via filling/capping process, Via-in-Pad technology can be used to produce high-density PCB designs without the use of chemical enclosures, avoiding soldering errors.In addition, this can provide the BGA with additional conductor traces. We use this technology for many years now and know how to ensure a reliable and safe production process.